3/4-10UNC, 7/8-9UNC,1”-8UNC, 1 1/8-7UNC, 1 1/4-7UNC. 3/4-16UNF, 7/8-14UNF, 1”-12UNF, 1 1/8-12UNF, 1 1/4-12UNF. Material: SUS304, SUS304L, SUS316, SUS316L, SUS200,SUS201.. Surface treatment: Nature, Passivate, Black, Zinc Cr+3, YZP, H.D.G. 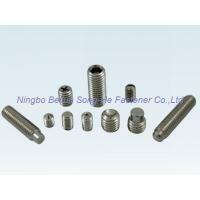 (DIN125, DIN6921, SO7089), Spring Washer, (DIN127), Hexagon socket set screws(DIN913, DIN914, DIN915, DIN916, DIN551, DIN906, ISO4026, SIO4027, ISO4028, ISO4029, ISO4776).